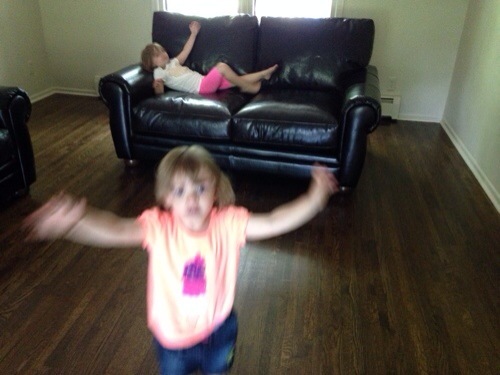 On July 17, 2014 July 17, 2014 By JillIn Funny kids, Uncategorized, What's Going On? “I love you,” Gia said to the random lady, and I don’t mean random in a bad way, she was really sweet! This was the lady who bought our piano from us. She was from Craig’s list, we never met her before, but Gia loves her. Isn’t it funny how kids just “say the darnedest things…” Or perhaps she really does love this woman because she took away that loud piano that took her friends away…I can’t tell you the amount of times Gia was so excited to boss a friend around (she can be a bit direct) and then they would come over and run to the piano that we somehow got conned into buying from the previous owners of our house. They would bang away on the keys as Gia sulked, but never for long though. She would quickly recover and go scrounge for a snack, her favorite hobby. Gia would ask repeatedly when a friend was coming over, and by repeatedly, I mean over and over, about every five minutes, from the time we woke up, until said person’s arrival…”Mom, when are they coming? Are they here yet? What time are they coming? What day is it today? What day are they coming? I’m hungry…just thought I would throw that in there because G is always hungry… Come to think of it, I think she must ask to have a snack 15 to 20 times a day… I’m going to start keeping track and will get back with this most important figure. I am not making this up…it’s constant. Oh now, this is getting ridiculous because today she just told the man who delivered our new couches that she loved him…should I be worried? Bad picture – too lazy to take another – Gia’s second random love delivered these fabulous leather couches today. Don’t forget to click on this banner. Every time you click, it counts as a vote. And for anyone confused, as my friend Debbie asked me (thanks Debbie for reading and clicking:) and all of my friends, it just takes you to their site. That’s it. Thank you so much for reading and clicking.